This is a first for me, reviewing a colouring book (a current and very popular fad), but it is a Discworld colouring book and that makes it awesome. 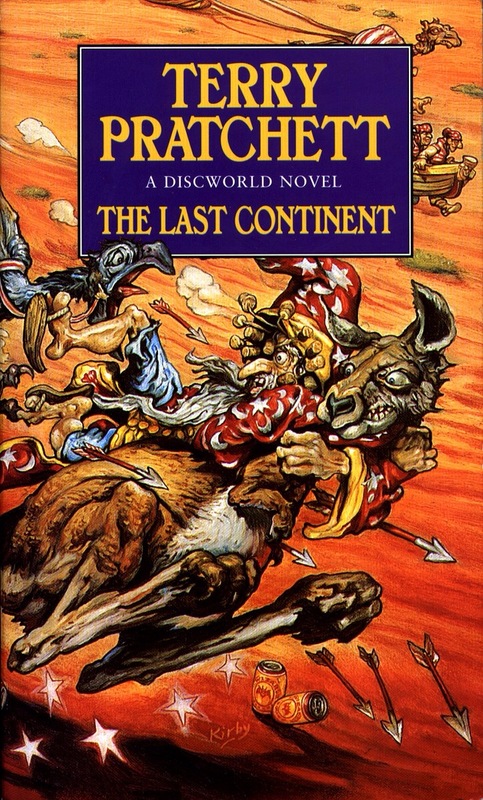 Check out the blurb below..
Paul Kidby, Sir Terry Pratchett’s artist of choice, provided the illustrations for The Last Hero, designed the covers for the Discworld novels since 2002 and is the author of the definitive portfolio volume The Art Of Discworld. If Terry Pratchett’s pen gave his characters life, Paul Kidby’s brush allowed them to live it. 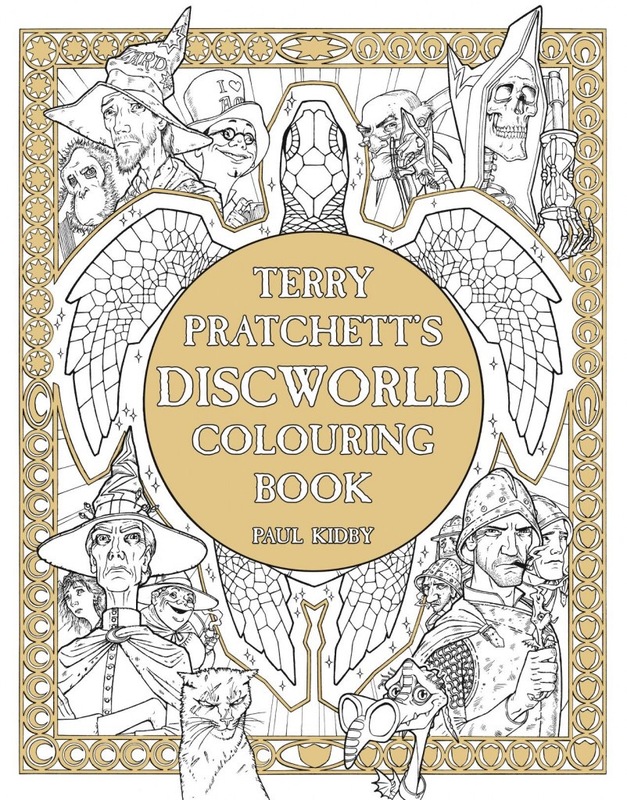 Containing black-and-white line drawings based on his hugely popular artwork as well as original pieces produced exclusively for this book – featuring such iconic Discworld personalities as Granny Weatherwax, Sam Vimes, Archchancellor Ridcully, Rincewind, Tiffany Aching and, of course, DEATH – Terry Pratchett’s Discworld Colouring Book is required . . . reading? . . . for all Discworld fans. Let me preface this by saying, I hid this from my son as soon as I opened the parcel. I love him but he’s a toddler and will daub colour and wild scribbles on anything that stays still long enough. Including me. From the stylish cover to the excellent set of illustrations in the back of the book, this is both a testament to Terry Pratchett’s wonderful Discworld and Paul Kidby’s brilliant visual interpretation of those characters and places. Many of the drawings available to colour are accompanied by fantastic quotes from the Discworld novels, adding a great (and, for me, nostalgic) element to the concept. The illustrations are fantastic and I, for one, will not be attempting to let my (or my son’s) crayons loose on such a magnificent book. In the second book of his series, Randy Henderson has once again produced an 80’s tinged, barn burner of a novel. His debut, reviewed here, was one of my favourite reads last year. 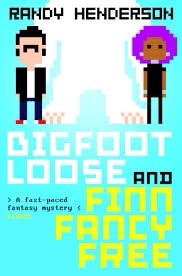 Bigfoot Loose and Finn Fancy Free builds on everything of that first book and continues the momentum like Kevin Bacon punch-dancing his way through a forest of stonewash denim. Though the pop culture references to the 80’s add a certain coolness (especially for those of us who remember that decade), they really serve as an anchor-point for the eponymous hero, Finn; having been exiled to the Other Realm for 25 years as a teenager, his whole point of contact with socio-cultural norms stops at the 1980s. It’s the greater story at large that is the real attention grabber and, with the feel of a Goonies type tale of fantasy and adventure, it rocks along at a serious pace with excellent results. Set a mere three months after Finn’s first adventures, Bigfoot Loose and Finn Fancy Free delves a little deeper into the world Henderson has created whilst setting his protagonist on another quest of solving problems because he’s at the wrong place at the wrong time trying to do the right thing. With Henderson, it is definitely the journey and not the destination that is the most fun. The scrapes and trouble that Finn seems to attract are all enjoyable to read and though the villain behind it all isn’t surprising, the path to the concluding chapters is. There’s so many brilliant little details peppering this book (my favourite being the gnomes) and a lot more than just a magical fantasy plot at its heart. The emphasis on Finn’s relationship with Dawn is thoughtfully and poetically drawn whilst his family dynamics are exceptionally handled, from the witty banter to the heartfelt emotions at play. Bigfoot Loose and Finn Fancy Free shows off Henderson’s comic talent but also his ability to go that little deeper and to touch on subjects a little tougher to take. Like it’s awesome cover, the book is fun and super enjoyable to read but in it’s heart it’s touching and clever. I can’t wait for more. I don’t read much satire but I do appreciate the format (my wife and I have nearly every Terry Pratchett Discworld novel). Marie Phillips has already made a name for herself with her debut, Gods Behaving Badly. 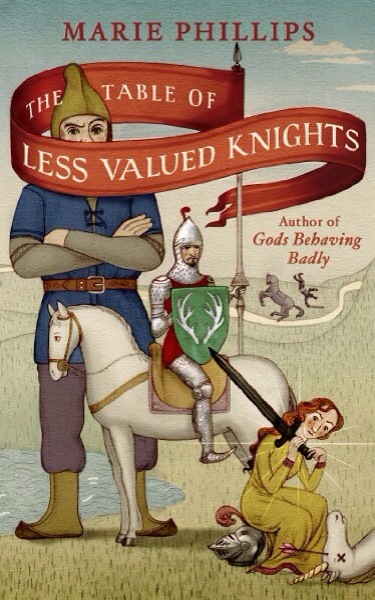 This, her second novel, takes Camelot as it’s focus for some funny bone treatment. Check out the blurb below. Sir Humphrey du Val of the Table of Less Valued Knights – Camelot’s least prestigious table, with one leg shorter than the others so that it has to be propped up with a folded napkin – doesn’t do quests … until he meets Elaine, a damsel in distress with a secret to hide. Meanwhile, Queen Martha of Puddock is on the run from an arranged marriage to the odious Prince Edwin of Tuft. But an encounter with the Locum of the Lake (standing in for the full-time Lady) leaves her with a quest of her own: to find her missing brother, long believed dead. The two quests collide, introducing a host of Arthurian misfits, including a freakishly short giant, a twelve-year-old crone, an amorous unicorn, and a magic sword with a mind of her own.